The deal will result in the loss of 9,000 jobs worldwide. Germany's Commerzbank has agreed to buy Dresdner Bank from insurer Allianz in a deal worth 9.8bn euros ($14.4bn; £8bn). The move will result in 9,000 job losses, with around 1,000 positions to be cut in the UK where Dresdner has substantial operations. 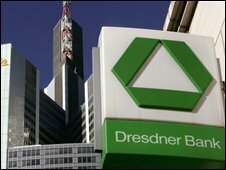 Dresdner had been hit hard by the sub-prime crisis and Allianz and Commerzbank are contributing 1.25bn euros to cover further losses. The deal will create a real rival to Germany's largest bank, Deutsche Bank. The combined group would be Germany's biggest bank in terms of customer numbers, although it would still be a distant number two to Deutsche Bank in terms of assets. The price tag is less than the 14bn euros Allianz paid for Dresdner seven years ago. Allianz will keep a 30% stake in Dresdner after a two-step transaction involving exchanges of both cash and stock. The deal will be completed by the end of 2009. The deal also keeps Dresdner in German hands. The company had attracted the attention of China Development Bank, a state-owned lender, which was reportedly prepared to pay a higher price. But such a deal would have required government approval from both Germany and China. Germany's finance minister Peer Steinbrueck said Commerzbank's purchase of Dresdner would benefit the country. "It's good for Germany as a business location and strengthens it as a financial centre," Mr Steinbrueck's spokesman Torsten Albig said. Commerzbank said the deal would help it expand in Germany and abroad. "We are building a market leader with European significance, and are creating added value for our shareholders," Commerzbank chief executive Martin Blessing said. "At the same time, the deal will secure many attractive jobs for the long term, even though unfortunately we cannot keep all current positions." 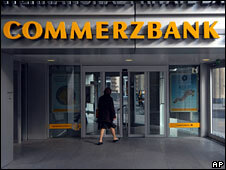 Dresdner Kleinwort, the group's investment bank, is expected to bear the brunt of the London job losses as Commerzbank plans to scale down its activities in this area. Commerzbank shares fell sharply in Monday trading as analysts feared that the deal would be costly and risky for the lender. "We believe it is highly risky for Commerzbank to make such a bold deal on the eve of a sharp economic downturn in Germany," said Dirk Becker, a banking analyst at Landsbanki Kepler. "Costs for integration and the downsizing of the investment bank could eat up the entire 2009 profit while the synergies will only come at a much later stage." Commerzbank shares were down 6.42% at 18.8 euros.